Well, August has begun and so has the season for field days. Here are a few I hope you mark on your calendars and plan on attending. Also a reminder, for all drought information from UNL Extension including crop, livestock, water, lawn, and garden, please check out http://droughtresources.unl.edu. With the drought and a shortage of forages, if you are considering harvesting or grazing crops for forage, it is important to consider the herbicide restrictions applied to these fields. Check the labels of these herbicides to confirm that grazing restrictions or forage harvesting restrictions have been met before you turn livestock into the fields or cut the crop for hay or silage. Check out this link for more information. Soybean Management Field Days Planned: Please mark the dates of the upcoming Soybean Management Field Days on your calendar. They are planned for August 14-17 with sessions planned for Lexington, O’Neill, Platte Center and David City. Registration for each of the Field Days starts at 9:00 a.m. with four one hour programs from 9:30 a.m. to 2:30 p.m. Topics include: Soybean Seed Treatments and Foliar Fungicides Growth Enhancement Interaction with Herbicides, Managing Land Leases and Soybean Marketing, Herbicide Carrier Rate Study and Quest for the Holy Grail in Soybean Production! Check out the sessions by going to http://ardc.unl.edu/soydays. The David City date and location is August 17th and it’s located from the Jct of 92 & Hwy 15, 1 mile east on 92 and ¾ mile north on county road. South Central Ag Lab Field Day: Some of you have been asking about the next field day at South Central Ag Lab near Clay Center. Please mark your calendars for August 22 from 9:00 a.m.-2:00 p.m. with registration beginning at 8:30 a.m. 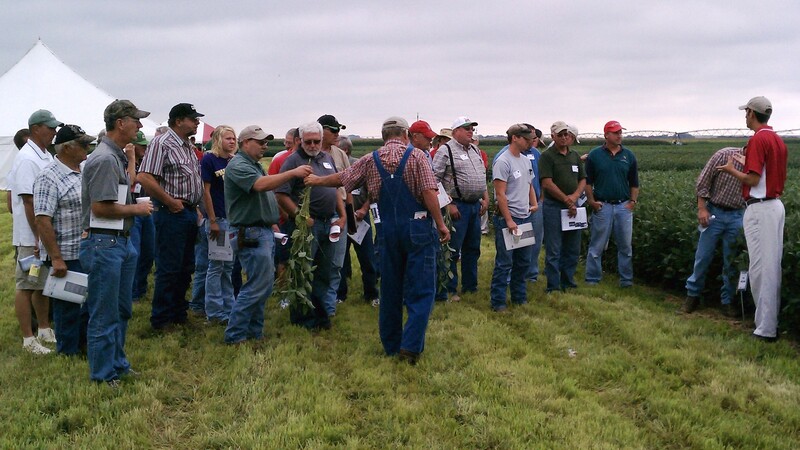 Topics include: Weed control, timing, resistant weeds; Emerging diseases of corn and corn rootworm management options; Impacts of corn stover harvest on soil quality and greenhouse gas emissions; Variable rate nitrogen and irrigation management according to landscape variation; and Use of Soy-Water for managing soybean irrigation. There is no charge but please RSVP for a meal count by Friday, August 17 to (402) 762-4403. Hope to see you there! York County Corn Grower Plot Tour: The York County Corn Growers Annual Plot tour will be held Thursday, August 23, 2012 from 5:30 – 7:30 p.m. This year’s cooperators are Ray and Ron Makovicka and the plot is located west of York on the Dwight Johnson farm. The plot is located ¾ miles north of Hwy 34 on Road I. Those attending will be able to check out the various corn varieties and visit with the seed company representatives. Supper will be served after the tour. Then there will be a report on 2012 practices, products used and irrigation update. Also this year they have several different types of irrigation equipment in the field to monitor soil moisture and estimate crop ET. Systems in the field include: AquaCheck USA provided an AquaCheck soil moisture sensor system; Servitech provided the Profiler Watermark soil moisture sensor system; McCrometer provided an EnviroPro soil moisture sensor system; and AquaSpy provided AquaSpy soil moisture sensor system. Several of you have asked about wireless irrigation scheduling systems-here’s your chance to compare them all in one place! Posted on August 6, 2012, in Crop Updates, Event, Research and tagged Agriculture, corn, Crops, Diseases, equipment, Extension, farm, farming, field days, Irrigation, Irrigation Scheduling, Nebraska, Plants, Soybeans. Bookmark the permalink. Leave a comment.